The liver is the largest internal organ in the body and also one of the most important as it carries out hundreds of specialized functions including detoxification or the breaking down of toxic substances for elimination. Most liver functions occur on the cell membrane of liver cells (hepatocytes). The liver doesn’t have any sensory (pain) nerves in it, so liver disease normally does not cause pain. If you drink alcohol regularly then you may, over time, develop a fatty liver and, over time, more serious liver problems. Fatty Liver is a mild form of liver damage caused by alcohol. It can also be caused by diabetes and obesity among others. A fatty liver looks large and yellow due to the increased fat accumulation in the liver cells. There are no specific symptoms and the condition is reversible. However, if left untreated, it can lead to inflammation cell death and fibrosis, and eventually cirrhosis. – Attacking the mitochondria (“power plant”) membranes and impairing the production of cellular energy. There is currently no medication for liver conditions. However, there are nutritional supplements such as polyunsaturated (also known as “essential”) phospholipids (PPL/EPL) and Alpha Lipoic Acid that have been shown to be beneficial to liver health. So, if you consume alcohol on a regular basis, do consider taking these supplements. The main component of PPL is phosphatidylcholine, the major constituent of all cell membrane systems including liver. PPL helps prevent liver (membrane) damage and maintain membrane integrity. PPL is able to reduce the accumulation of fat in liver tissue. It also works to reduce cell death and fibrosis (fibrous scar tissue). PPL improves general liver function. Antioxidants keep free radicals in check. ALA is the only known antioxidant with the ability to act in both water and fat medium. Researches have considered ALA to be very close to an “ideal” antioxidant. It can protect the total cell as it destroys fat-soluble free radicals formed in the cell membranes and free radicals formed in the cell membranes and free radicals in the water-soluble cellular components that comprise the bulk of the cell. Free radicals, generated by toxins such as alcohol during detoxification, can damage the cell membrane and other cell structures resulting in cell death. ALA is a powerful free radical scavenger and hence protects the liver cells by neutralizing these damaging free radicals. One of the most exciting discoveries made recently is that ALA can significantly boosts levels of Glutathione in the liver and other tissues where it is needed. It is the body’s primary antioxidant against free radicals produced by alcohol. Secondly, glutathione is an essential part of the liver’s detoxification process (Phase II system). When Glutathione encounters toxic compounds in the liver, it attaches itself to them through a conjugation process, making the compound water soluble. This allows toxins to be flushed out through the kidneys. Studies also show that there is a strong correlation between liver disease such as cirrhosis and low levels of Glutathione. Although glutathione is sold as a supplement, only very small amounts can be absorbed into the bloodstream. This is because glutathione is a large molecule, too large to be absorbed from the gastrointestinal tract. The best way to boost Glutathione levels is to take ALA supplement daily. PPL and ALA can be bought together in one capsule. Silymarin, the active constituent of Milk Thistle, helps the liver to regenerate by stimulating the growth of cells to replace the parts that are damaged. It is a potent antioxidant that protects the liver cells from free radical damage. Free radicals are generated as by –products of the detoxification process. Artichoke enhances the production of bile. Many toxins are eliminated through bile which also plays an important role in the body by helping to protect liver from congestion. Dandelion causes an increase in bile production and flow of bile into the intestines. The liver removes toxins by dumping it in the bile which then flows into the intestinal tract and is eliminated in the stool. Therefore, the greater the bile flow, the greater the cleansing of the liver. Schizandra was first used in Chinese medicine for liver protection. It effects comes from its active constituents, Schizandrins, which have the ability to boost the liver’s detoxifying capacity. This herb is used in Ayuvedic medicine. In recent years, scientists have discovered the active compounds of Phyllanthus are able to block the enzyme needed for hepatitis B virus to replicate. It helps protect the liver against viral infection. Picrorrhiza has potent antioxidant properties. It also appears to have the ability to regenerate liver cells and may be a promising agent for protection against hepatitis. The above supplements can be bought separately or together in one capsule. It is advisable for those who consume alcohol to take either the nutritional supplements (PPL together with Alpha Lipoic Acid) or the standardized herbal extracts. However, a synergistic combination of both is recommended for those who consume more than average amounts of alcohol regularly. 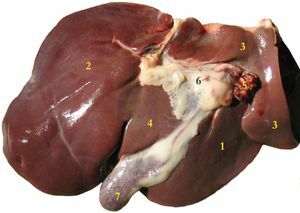 The liver is an organ in which plays a major role in metabolism and has a number of functions in the body including glycogen storage, plasma protein synthesis, and drug detoxification. This organ also is the largest gland in the human body. It produces bile, which is important in digestion. It performs and regulates a wide variety of high-volume biochemical reactions requiring specialized tissues. This entry was posted on Wednesday, January 3rd, 2007 at 5:48 pm	and is filed under Advice and Guide. You can leave a response, or trackback from your own site. One Response to "Liver and Alcohol"
That is interesting point of view. Visit my site to find out other ways of easy loose the weight.